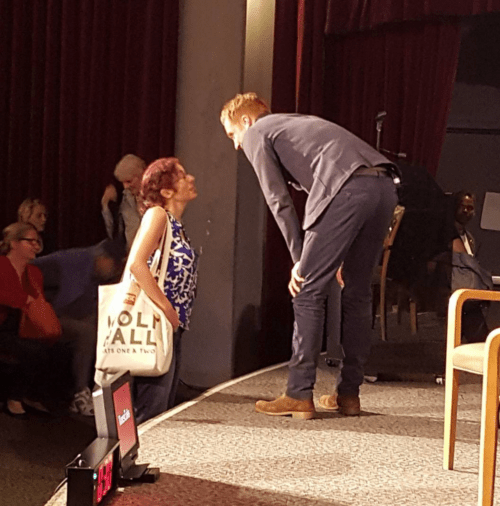 Damian Lewis was the guest of celebrated Times Talks at Directors Guild Theater and had a great conversation with Cara Buckley, a New York Times culture reporter and the new Carpetbagger. Well, on the day the UK votes to stay in or leave the European Union, a conversation with a British actor calls for a question about Brexit. And that was Buckley’s opening question. And, somehow, the conversation turned more political than I thought it would and I enjoyed it immensely. We all know celebrities tend to avoid from getting involved in political conversation probably because they do not want to lose fans. And I understand that. On the other hand, one may be an actor, a doctor, a teacher, or anything else, but first and foremost we are all citizens and we have responsibility to speak our minds about issues that we care about. And just THIS, I believe, makes an individual, regardless of who she or he is, and regardless you agree with her or him, a good citizen of the world. Thus, I applaud Cara Buckley for her hard-hitting questions and Damian Lewis for speaking his mind thoughtfully, knowledgeably and graciously. He was certainly in TOP form providing compelling arguments along with brilliant humor that cracked up the room one too many times! Now, it is quite a task to turn a one hour and fifteen minute conversation into about 2500 words. But I have such delicious quotes from Damian and I would love to build the review around them. Plus I have a BIG surprise for you! I have been able to have an exclusive interview with Damian after the event which I proudly call “Fan Fun Talks.” Why not? You can see our interview with Damian at the end of this review. First, I would love to thank Times Talks for spotting the most captivated person in the audience just right and posting this photo on Instagram: It’s yours truly beaming and taking notes! Second, special thanks go to the ladies sitting next to me, Paige, who is a brilliant blogger on Maximum Tuneage, and Joyce, who I met for the first time waiting in the line — we were the three earliest birds — for making the event even more special than it was with their sweet chat! It’s time. Here comes Damian! Cara Buckley opens the conversation with Brexit: Where does Damian stand? Damian talks about the general notion that the European Union (EU) is an imperfect project. As imperfect as it may be, he finds it worth pursuing. Damian sees a moral obligation for the UK to commit to Europe and contribute in the best way that it can. He points out the EU was, after all, a peace project, conceived with the hope European countries stop fighting each other, and the coherence it tries to bring with “the openness, the moving of the peoples, the freedom of trade, the exchange of ideas and a common value system” has granted a peaceful Europe in the last 50 years. Cara Buckley asks Damian about what his ancestors would think about Brexit. We find out his grandfather was the Lord Mayor of London. And Damian explains the difference between the Mayor of London, a political position, and Lord Mayor of London, a position borne out of an old tradition of merchants. The guilds of London were established as early as in the 13th century to ensure the goods traded in the city meet some particular quality. And the merchants whose goods met that quality became freeman of the city: They could pass the Thames into the city toll free and trade freely. It turns out Damian’s family had a connection to the merchant guild of Haberdashers and his grandfather was a Haberdasher. Based on the information he gives, his grandfather should be Lieutenant Colonel Sir Ian Frank Bowater. And Damian’s brother William, another haberdasher, is now becoming the Sheriff of London. And this is where Damian feels the urge to explain his brother is no Wyatt Earp 🙂 He also says the city guilds have come forward to back Remain vote. So what was it about Billions that convinced Damian to come back to America for another cable show? The conversation on Billions is quite involved at Times Talks — varying from shorting a company to CEO compensation to performance coaches to Bobby’s knitwear — so I plan to make a separate post on that part of the talk referring to particular episodes of the show. How come is Damian, a guy that went to Eton, so good at playing blue collar American men? How does he see American masculinity different from British masculinity? Does he ever miss Brody? Even though Damian misses Brody, he argues Brody needed to go. He was told early on he would be a two-season character but because the Carrie-Brody chemistry did wonders (it is all you to blame, Damian!) the writers were somewhat pressured to keep him around for another season. Damian talking about fans watching Homeland for different reasons is beyond hilarious. Some genuinely watched it as a relationship drama: “They’re gonna get together… They’re gonna have ginger babies…” Oh, Damian, now you can’t do this to me! My mom has been saying this for years: “Homeland is not a relationship drama. It is a CIA drama.” I still refuse to buy it! And, Damian, you don’t know, but Carrie and Brody live together and have a ginger baby in our Fan Fiction aptly titled Divergent 🙂 And my favorite bit: “And Liberals were just saying… This is so interesting… What is a terrorist act?” BIG LAUGHTER. Damian is so spot on! Our Kind of Traitor derives its story from the real world: A load of dirty Russian money is used to set up a new Russian bank in London. Damian points out this is a tale of London, but also of Manhattan, where multinational money is “stripping out the soul and heart of big cities.” He is intrigued by his his character, Hector: yet another ambiguous individual stuck between his self-interest and his getting caught up in the emotion of the story. What does he think about actors from posh schools dominating the acting scene? Time for Q&A: Cara Buckley asks a couple of questions she earlier collected on Twitter. I am happy to report she asks Damian two questions from my brilliant partners! UPDATE Hehe. But the Welsh half of Damian tweeted THE answer – sort of – on July 1 on Twitter. And you know we really think Damian Lewis should play Steve McQueen in a biopic, right? And what about me? Well, I am over the moon! Even though they did not take any questions from the audience, Damian let me do a little interview with him after the event. Damian knows my husband is often with me at events and jokes “you always have your photographer with you.” Today my photographer is not there because he is on a plane. But I am extremely lucky to have others (total strangers!) to take care of photos! Thanks go to Duane Ferguson for taking this shot and sharing it on Instagram. And many thanks go to Damiansgal (she has a wonderful Tumblr page!) for letting me know about it. So… We present our first Damian Lewis at Fan Fun Talks 😀 We talk about Billions and Our Kind of Traitor. Please ENJOY! You can see the entire Times Talks interview here. Thanks ladies for sharing your TimesTalk review. Much appreciated. Big congrats on scoring the personal interview with Damian, it was extremely good of him to meet with you knowing how full on his schedule is! And thanks for promoting my Tumblr page. Looking forward to season two of Billions. Thank you so much and I am so glad you liked the review. The conversation covered so many topics and I tried my best to pick and choose stuff that were hearing for the first time from Damian. There were also the stories we have heard several times from him wearing a woman’s thong when he made The Escapist to how they filmed the hanging scene in Homeland and to Damian signing Homeland box set for Obama 🙂 I loved the variety of topics they talked about and I very much respect the way Damian spoke his mind on a range of issues, including pretty political ones. And I plan to do a completely separate post on the Billions conversation linking to specific episodes which could, in my opinion, be more helpful for everyone to understand the jargon there. I was so LUCKY to have the interview with Damian. They did not let the audience ask questions and I had mine all written down… and he just let me ask all of them to him separately 🙂 And you are absolutely right. He was pressed for time, would go to dinner with his agent, and he stood him up a little to do the interview. Damian is an extremely talented actor but he is also an extremely kind man. It is all our pleasure to promote your Tumblr page – you are doing a fantastic job! Thanks for visiting and reading us and, as always, thanks so much for reblogging our posts on Tumblr! Cheers! I’m over the moon as well ! thank you as always for your wonderful story! Damian seems to have great respect for you, every time he sees you, he tells you, and he even accepts an interview, then he is very requested by the press! I’m not jealous of you, because you deserve it, but I admire and envy you! Thank you so much, Monique, for your very kind words! <3 We would not be Fan Fun without your and our other readers' support! It is you all that make this community vibrant and I am so happy to report that Damian likes and appreciates this. We are so lucky! Damian has been extremely kind to us and made time for us every single time even when he was pressed for time like Thursday night. He had to make his agent wait a little so he could do the interview. Great post! I feel like I was there (oh how I wanted to be). Besides being an incredible actor, DL is just a genuine nice guy! And, at the end of the day, that is what is to admired about him! No airs, no attitude. Kudos to you my friend; for all your hard work, and dedication to this blog. It seems like you are the first person DL goes to now when he answers Qs! Thank you, dear partner! For all your kind words. But we are in this together and I cannot think of a better team. Thanks for being a part of this! And I really really wish that you had been there with me. But I also understand it was a day that markets could go anywhere – what a day! I guess even Bobby Axelrod would not come to hear Damian that day 🙂 You are absolutely right. No airs, no attitude. Just an extremely kind person. And of course being a talented actor is wonderful but nothing can beat being a kind person. And, hey, can’t wait to see you Tuesday! Reading this blog and watching the interview has put a smile back on my face. Damian is so good with his time and answering some questions for you…poor Lewisto missed it as well. Genuine LOL at his refusal to answer the England/Wales question. I thought he may not do so if the question was asked, but it is good to know I asked a question which had him ‘torn’. I strongly suspect ‘torn’ is a look he wore well, being the thinker that he is. I would also be delighted to see him playing Danny in Greece! I am sure Jania Jania will love that answer to her Steve McQueen question (I do to). Thank you for bringing us the highlights. I am so happy to read this because you deserve a smile on your face – always! And it’s all my pleasure to bring the highlights to the blog. WOOOOOOOWWWWW Te felicito !!! Qué maravillosa experiencia!!! Gracias por compartirlo!!!! Debe ser fantástico cumplir el sueño de conocer y hablar con su ídolo. Muchos besos desde Argentina. I speak only little Spanish but I am able to understand what you are saying — I am much better in understanding what I read in Spanish than writing and speaking! It is my pleasure to share the Times Talks review and the little interview I had with Damian. I am so glad you liked it! And you are right. It is simply fantastic to meet and talk to your idol. In fact, some say it could be dangerous because your idol may disappoint you. But I am extremely happy to say Damian does not disappoint. Quite the contrary: He’s an extremely talented actor but also he’s an extremely kind man. Much much love from the US, please keep your feedback coming! Tremendous job. Like you said, there was just so much to say and you want to write every single word down (which I think you did). Great interview with the “secret questions.” I’ll remember it forever. And thanks so much for your kind words on the interview – both here and on your own blog and also to link to our post and the interview. I really appreciate it. And likewise I will remember it forever. And guess what Joyce has just left a comment on the blog. So we all connect! Cheers! From Joyce (second in line). Thank you for your kind reference of our immediate friendship in anticipation of the Times Talk. I’m so sorry Paige and I lost you in the crowd. We looked feverishly but you were too quick on your feet. Seeing your interview with Damian made me smile even more, if possible. Great night, great memories. Joyce!!!! So glad you are here!!! I will send you an email from my personal email account so we connect! I am so glad you came to visit the blog and hope you keep coming. I know you enjoy Billions and We do a lot on Billions (episodes recaps, news as well as themed essays) and will keep doing so and we would LOVE your feedback! Oh goodness, what to say that hasn’t already been said? How fortunate to have the chance to see and talk to this man who we’ve based this entire compendium around, this collection of love letters. So proud to be in this company! And how very generous he is to take the time to wish us well and to encourage us so genuinely to keep on keeping on. It’s unbelievable, all of it! Bravo to us! YES! Believe me, partner, I am still pinching myself and it turns out it’s all real! It feels GOOD. I am so proud to be in this company with you all and as I always say I just cannot think of a better team.